If you knew me when I was ten and offered me an empanada for merienda, the kind that’s deep-fried and stuffed with savory ground beef and sweet raisins, I probably wouldn’t eat it. If it were a slice of pineapple upside down cake, a Bavarian Crème doughnut, or even a simple hot pan de sal slathered with butter and sprinkled with sugar, then it would be an entirely different story. I’ve always had an insatiable sweet tooth since I was a kid and I would never turn my back on anything sweet. But whenever my mom brought home empanadas for everyone, I would split mine open, laboriously pick out and eat the raisins, and leave everything untouched. But as I got older, I became more and more fond of the empanada — deep-fried turnovers stuffed with beef, sometimes chicken. It’s a popular, portable merienda, or mid-day snack, in the Philippines and throughout Latin America. Here in San Francisco, El Porteño’s buttery Argentinian carne empanadas filled with Prather Ranch ground beef, raisins and olives closely resemble the ones I grew up with. Another favorite is Chile Lindo’s Chilean empanadas that come stuffed with an egg, which is very similar to Vigan empanadas from the northern part of the Philippines. 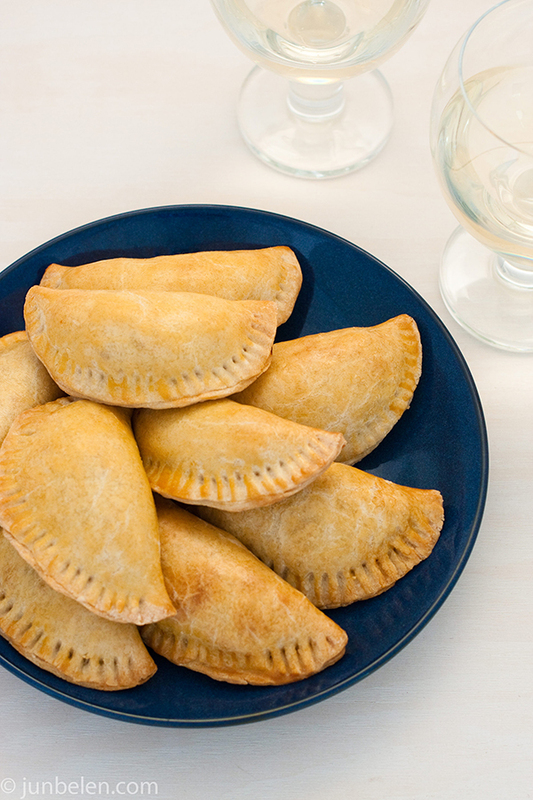 Empanadas make perfect hors d’oeuvres. I made beef and chorizo empanaditas using a recipe I adapted from Amy Besa’s and Romy Dorotan’s Memories of Philippine Kitchens. These empanadas are baked and not deep-fried. Chicken, duck, shrimp or crab can be used instead of beef and chorizo. Sweet empanadas filled with fruits, nuts, and dulce de leche are a brilliant variation. Too brilliant, if I may say so. Now, that’s my sweet tooth kicking in. Sift the flour and salt into a large bowl. Cut the chilled butter into the flour mixture with a pastry blender or work it in lightly with the tips of your fingers until the consistency resembles coarse meal with visible bits of butter. Stir the egg into the flour mixture until fully incorporated. Pinch off a small handful of dough. If it does not hold together, sprinkle the dough with ice water. Blend the water gently into the dough until it just holds together. Place the dough out onto a clean lightly floured work surface and pat it into a disk about half an inch thick. Wrap the disk in plastic wrap and refrigerate until form, at least an hour or up to two days. In a large pan over medium heat, heat the oil. Sautee the onions and carrots until the vegetables have softened, about 5 minutes. Raise the heat to medium-high and cook the ground beef and chorizo until the meat has browned, about 5 minutes. Add the sweet potatoes and Yukon Gold potatoes. Add the soy sauce, rice wine, rice vinegar, and raisins. Reduce the heat to medium, cover and cook until the potatoes have softened, about 30 minutes. Add the green peas and heat just to cook through, about a few minutes. Taste and add more vinegar and salt to taste. Take one disc of the dough from the refrigerator and place it on a clean lightly floured work surface. Roll out the dough to about 1/8-inch thick. Using a 4-inch round cookie cutter, cut the dough into circles, saving the scraps. Gather the scraps and roll them again. Using a spatula or your hand, gently transfer the cut dough to a baking sheet lined with parchment paper. Ten to twelve 4-inch circles can be cut from one disc of dough. The dough can be rolled out and cut into circles ahead of time. Just wrap them tightly in plastic wrap and refrigerate up to a day ahead. Cup the cut dough with one hand and gingerly spoon 1 to 1-1/2 tablespoons of the filling into the center of the dough. With a pastry brush or with tip of a finger, lightly dab the edges of the dough with egg whites. Fold the dough to form a half moon, enclosing the filling. Gently seal the edges of the dough and crimp them decoratively with the tines of a fork. In a small bowl, whisk together the egg yolks and milk. Brush the tops of each emapanada with the egg wash. Bake them until they are golden brown, about 25 minutes. Let them cool slightly before serving them warm. 1. The recipe for the filling makes 36 4-inch empanadas while the recipe for the pie crust dough makes a single 9-inch pie crust equivalent to ten to twelve 4-inch empanadas. I usually make two dozen empanadas, which needs two pie crust doughs. I use the leftover filling for something else like mixing it with fried rice or using it to make omelettes for breakfast. 2. The original recipe calls for Russet potatoes but I like Yukon Gold potatoes. The recipe also calls for diced shiitake mushrooms. 3. Use the amount of soy sauce, rice wine, rice vinegar, and salt as a guide but feel free to add more or use less. I adapted this recipe from Amy Besa’s and Romy Dorotan’s Memories of Philippine Kitchens. The original recipe, as written in their book, seriously lacked flavor. The recipe called for three tablespoons of soy sauce and three tablespoons of rice wine and made no mention of salt, which I found too stingy. 4. The leaner the beef, the drier the filling. I recommend using 80% lean ground beef for a moist, more flavorful filling. If the filling becomes a bit dry, I suggest adding about two tablespoons of butter when adding the green peas toward the end. 5. Shredded chicken, a mixture of both dark and white meat, can be used as a substitute for ground beef. Other proteins that can be used instead are duck, shrimp and crab. Oh, my! That was so cute opening up the empanadas for the raisins! Jun, I often tell my son when I’m eating something he doesn’t quite enjoy yet, “You’ll probably like this, too, when you’re a little older.” Sige, I’ll try this sometime next week. Thanks for sharing. I enjoyed your essay as usual. Thank you, Annapet. I have outgrown my picky-ness a lot. I used to not like vinegar. I hated the smell but I have 6 kinds of vinegar inmy pantry right now. I’m sure your son will be like me, too! Reminds me of Cuban-style Piccadillo — I use Mary Urrudia’s recipe which has a neat little trick: the pototoes are cut up and fried crunchy then added into the meat/spice/rasin mix. Yummola. Love your pictures! That trick with the crunchy fried potatoes sounds really really good with my empanadas! These look yum! Can’t wait to try them, except I’m not a fan of chorizo. Do you think they’d turn out well with just the beef? Thank you, Stephanie! 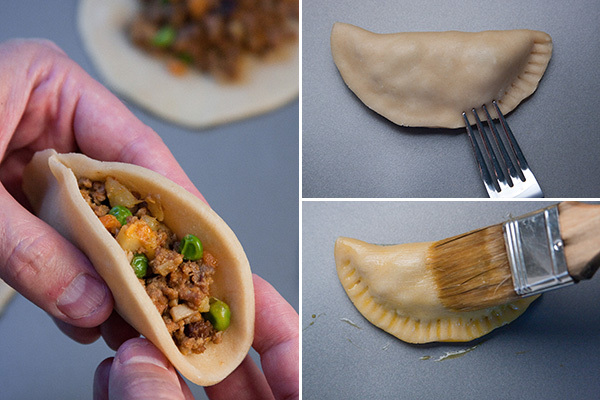 Empanadas are great because you can pretty much fill them with anything. The recipe will work even without chorizo. I also like chicken empanadas, just replace the ground beef with shredded chicken — a mix of white breast and dark meat. Hope you’re enjoying your weekend! Well, we have a different tastebud for snack. I have liked savoury snacks since I was a kid. Jun, are you not planing to buy the pastry cutter? I’ve always wanted to make empanadas. Yours look delicious. Looks like a labor of love. Beautiful photos. I made samosa (Indian version) the other day which are very similar to this empanadas. Love this. Only thing I change as a vegetarian is to make it beef-less. Thank you, Pam for the note. And yes they’re very very similar. And both very very tasty. Thank you for stopping by! These are so gorgeous that I had to share them with my readers. Beautiful work! Thank you for sharing! Wow they just look simply amazing (and delicious)! I am a big empanada fan so thank you so much for sharing this great post! am your new avid fan, your recipe on empanada seems scrumptiously delicious, am going to try this on my son`s birthday party, am sure my Japanese family and friends would love this! i also enjoyed your posts! Hello Jun, i owe this comment to you, picture perfect i made your recipe, this should be called “Gourmet Empanadas” everyone rave about this new stuff, thanks a lot for sharing! LOL i hate raisins in empanadas too, but now i’m just too lazy to pick them out. though sometimes i’ll remember, especially if they’re honking huge! i’m sooo going to try these out! thx for the post! Thank you, Lala! Try them — they’re really good. Make the crust thin so it becomes crispy and flaky! 3 years later, I finally tried them lol!!! Thanks Kuya! Keeping this on my recipe roster! BTW lol i just noticed the palaman is our traditional kind. shh i won’t tell.